Did you know that the growing medium used to grow lettuce on the International Space Station (ISS) is exactly the same as the clay ‘dirt’ between first and third base at the Tropicana Dome? Did you know NASA has developed robots that astronauts recently controlled on the earth’s surface from the ISS? Things are really hopping these days at NASA, Space X, ULA, and Blue Horizon facilities all across the U.S. Nowhere is that more evident than at the Kennedy Space Center (KSC) where there is always a rocket on a launch pad these days with NASA, Space X, and ULA having long-term projects related to space science and exploration, including commercial missions as well as missions to deep space and Mars. Have you ever wanted to go behind the scenes of a rocket launch at Kennedy Space Center? 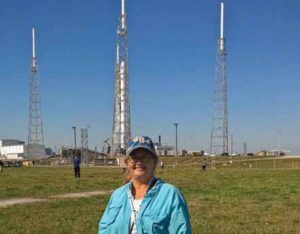 In April, I had the good fortune to join 50 people from all over the United States to attend a two-day NASA Social at KSC which centered on the launch of the Space X CR8-Dragon Cargo resupply mission to the ISS. What is a NASA Social? It is a NASA sponsored PR/media event for people active on various social media platforms such as Facebook, Twitter, Instagram, SnapChat, and blogs. NASA wants people of all ages and interests to learn more about space and space exploration, and to share the experience with their social media audience. April’s NASA Social members had the opportunity to tour facilities, speak with scientists, engineers, astronauts, and managers and watch the Space X launch from inside KSC. The group met with astronaut Doug Wheelock who served on the ISS in 2007 and again in 2010 where he served as commander of Expedition 25. He made six spacewalks and was the first astronaut to ‘check in’ from Space in 2010 via FourSquare. 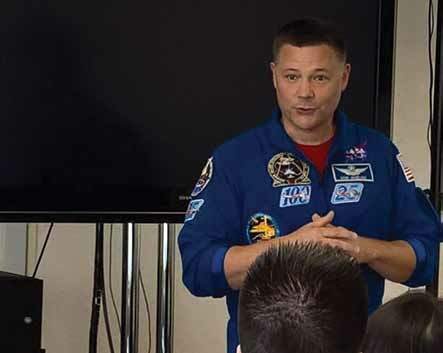 He spoke with us at length about life on the ISS. Then, unexpectedly, he hopped on the group’s bus for the ride out to the Space X Launch Pad continuing to answer questions about working on the ISS and readjusting to life back on Earth. Did you know that many ISS astronauts have a decline in vision clarity that initially worsens upon return to earth? 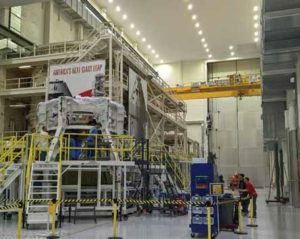 There was an up-close-and-personal tour of the ‘high bay’ facility where Orion, the next generation of spacecraft, is under construction. The crew and service modules are being built for an unmanned test launch in 2018, a manned expedition to an asteroid in the 2020s, and Mars in the 2030s. The 550-foot tall Vehicle Assembly Building (VAB) is the most recognizable structure at KSC and is a bit like Mecca for space nerds. It is where rockets are assembled and readied for the slow crawl to the launch pad. The NASA Social group not only got a tour, but got to ride up in tiny elevators, and take a walk across a caged catwalk 20 stories up to access the rooftop where they could see the entire KSC complex in one 360° panorama. It was stunningly beautiful, filled with history, and inspiring. All the many launch pads, old and new, were visible. 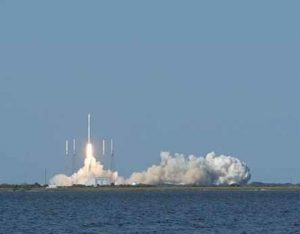 The two-day event culminated with the launch of the Space X rocket delivering the CRS-8 cargo ship to the ISS. The group had a direct view across the water from just two-miles away on the edge of the NASA causeway, right next to the ‘traditional’ media section. The normally gregarious group fell silent as the engines fired and the Dragon X lifted off. There were more than a few teary eyes as the deep, powerful, rumble reached us and the SpaceX rocket continued safely up into the sky. Ten minutes later, raucous cheers went up from a group huddled around a single iPad set up on the grass watching the NASA live stream. The Space X Stage One rocket, for the very first time, had successfully landed on a drone barge just off the coast of Florida. History had been made and we witnessed it. Anyone interested in knowing more about future NASA Social programs can visit www.nasa.gov/connect/social for more information.